In the 1600s, the Chesapeake Bay Basin was a prosperous mosaic of wetlands, forests and meadows with a smattering of farmland. Waterways were largely pristine: the natural areas trapped and absorbed eroded sediments, excess nutrients and other pollutants, preventing them from washing into the water. But haphazard development and population growth led to a modification of these natural areas. Nutrients like nitrogen and phosphorous blended with sediments washed into the Bay and its tributaries, significantly lowering the water quality and altering the entire ecosystem. Bay states have implemented plenty of protection and restoration measures, but they’ve been unable to turn around the Bay’s increasing degradation. In 2010, President Barack Obama stepped in with an executive order requiring the six states surrounding the Chesapeake Bay, as well as Washington DC, to reduce pollution and implement actions that will restore clean water to the Bay. In response to the executive order, the EPA determined the Chesapeake Bay Total Maximum Daily Load (TMDL), which sets limits on how much pollution can flow into the US’s biggest estuary and will ensure measures needed to control contamination and fully restore the Bay will be in place by 2025. The federal mandate has helped mobilize states on cleaning up the Bay. Pennsylvania’s Nutrient Trading Bill Pledges To Reduce Cost And Improve Results, But Will It Work? Two organizations with a shared interest in improving the Chesapeake Bay watershed are divided over a draft nutrient trading bill in Pennsylvania, with supporters foreseeing a slash in the cost of Bay cleanup and opponents seeing technology that isn’t cost-competitive or compliant with state and federal regulations. 4 September 2013 | Ed Schafer and Harry Campbell both say they want to clean the Chesapeake Bay. They even seem to agree on the need to stifle the flow of animal waste into the Bay from farms. What they can’t agree on, however, is how Pennsylvania should structure its nutrient trading program, and specifically whether technologies like manure treatment should be recognized in that program. Proponents like Schafer want to create a competitive bidding process designed to recognize the most effective method of reducing nutrients, and they claim Senate bill 994 will produce better ecological results than techniques being used currently while cutting the cost of Bay cleanup for taxpayers by up to 80%. But opponents like Campbell argue this competitive bidding process allows for nutrient reduction strategies that don’t comply with state and federal regulations, which means they will generate credits that companies can’t use to meet their nutrient reduction requirements. Why the Fuss Over Manure? Manure treatment technologies use a combination of biological, chemical and physical processes to neutralize the negative effects of animal manure, which is a major source of nitrogen flowing into the Bay. Despite the technology’s high cost, it’s likely to be a bid winner in Senate 994’s competitive bidding program because it will generate a high amount of nutrient reductions as well as local environmental benefits-two significant factors in determining initiatives that will win bids. Opponents of the bill say the technology’s high cost will drive up the cost of nutrient trading credits. These technologies also haven’t been approved by the Environmental Protection Agency (EPA) as a nutrient reduction method, although they are on an EPA list of potential methods and will likely be reviewed this fall. The debate over using this technology and Senate bill 994 as a whole has only intensified as both sides are intent on making their voices heard. Two organizations in particular have been especially vocal about their approval and disapproval of the bill. Campbell is the Executive Director of the Pennsylvania branch of the Chesapeake Bay Foundation (CBF), a non-profit organization working to restore and protect the Bay. Schafer, a former US Secretary of Agriculture, heads the Coalition for an Affordable Bay Solution, (CABS) a collaborative organization formed to support the creation of a competitive bidding process for nutrient trading in Pennsylvania. They have been major supporters of the bill since its beginning. 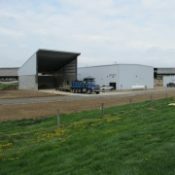 Two founding members of CABS are Bion Environmental Technologies, which is a supplier of manure-treatment technologies, and Krieder Farms, which has one such manure facility located on its farm. Senate Bill (SB) 994, or the Major Watershed Improvement Act, was introduced to the Pennsylvania Senate in June. The bill promotes a competitive bidding approach where any source of pollution- like wastewater or livestock manure-and any practice, such as manure treatment technology, can participate so long as the nutrient reductions it causes are verified by the Pennsylvania Department of Environment (DEP). The state will accept bids from farms and other sources of pollution and then agree to purchase nutrient reduction credits from the entities with the winning bid. The bids’ are evaluated based on the cost and environmental benefits of the proposal as well as the amount of nutrient reductions it generates, according to the bill’s text. According to a study by Pennsylvania’s Legislative Budget and Finance Committee, a shift to a competitive bidding program that relies less on agricultural and urban stormwater to achieve nutrient reductions could result in the 80% reduction in the cost of Bay cleanup. Campbell says he doesn’t dispute the importance of manure technology and the role it plays in cleaning up the Bay. “We do commend Senator Vogel and the other senators who are interested in thinking outside the box as to how we can more cost-effectively deal with the problems at hand,” says Campbell. However, if a new plan doesn’t mesh with the state’s regulatory system, then time, funds and energy are wasted on an initiative that doesn’t deliver needed results, Campbell says. Pennsylvania’s current regulations focus on certified stormwater entities and wastewater treatment plants as well as compliance with the Clean Water Act and Pennsylvania’s Clean Streams Law-which a new system would have to be in coordination with. There are entities in Pennsylvania under regulatory obligations to reduce their nutrient pollution, and if Pennsylvania creates credits that aren’t meeting these requirements, those reduction credits are of no use to the entities. “We can’t use these reductions toward regulatory obligations and we can’t use them to demonstrate progress as a state,” says Campbell. He adds that this may change in the future as Campbell believes it should, but as of right now, those reductions don’t fit into Pennsylvania’s regulatory construct. An open discussion on integrating manure technology that isn’t convoluted with misleading or confusing language is needed, Campbell says. “This bill suffers from ill-defined definitions and inappropriate language,” he says. Misleading language like, ‘verified,’ and, ‘certified,’ in front of the term, ‘TMDL parameter’, which has regulatory implications linking it to Pennsylvania’s nutrient trading system, says Campbell. This implies that the credits generated can be used toward fulfilling a regulatory obligation, he says. “If you use those terms and intermix those terms, yet don’t tie them to the regulatory construct, then you’re not creating a real or marketable credit, even if it happens to be a reduction,” he says. Despite the fact that the terms in the bill’s text relate or link it to these obligations, an entity like a wastewater treatment plant can’t use the credits generated, Campbell explains. Campbell says that Pennsylvania already has an established marketplace for nutrient trading and if the manure treatment technology works and is cost effective, it should be incorporated into the already existing system. CBF has also argued that this technology is expensive. Presently, the cost of nutrient credits is sold for $2.98 to $3.05 per credit (each credit represents one pound of pollution reduction), according to the CBF. But credits generated via manure-treatment don’t become cost effective below $8 to $10 each. Schafer, on the other hand, doesn’t dispute the technology is expensive. But he does argue the current program Pennsylvania is using isn’t working. This includes wastewater treatment plants, manure-treatment technologies or people trucking manure off of farms, he says. Schafer says the bill brings in the ingenuity of the private sector with technology that works and can prevent a sizable portion of nutrients from entering the watershed. Currently, solving the problem is directed to municipal wastewater treatment plants. But Schafer argues the problem of nitrogen pollution could be solved on the farm before it enters forests and flows through wetlands into the treatment plants. The source of the pollutant isn’t important, he says, so long as real nutrient reductions are accomplished. “What a lot of people don’t realize is 50% of nitrogen from animal manure is airborne,” he says. But the point of this pollution isn’t attributed to agriculture but rather to stormwater runoff or from industrial sources. This pollution source could be halted on the farm. “If the nutrients are taken out on the farm, then you have a local benefit of not having the nutrients impact other areas,” Schafer says. But in order for farmers to tend to animal manure before it spreads, they need to be properly equipped, and so an investment mechanism is needed to raise the necessary funds, Schafer says. This is where SB 994 comes in with the competitive bidding program. According to Schafer, the DEP will verify that the nitrogen has actually been removed. Farmers can then sell their verified nutrient reductions as credits directly to the state. Ideally, the design enables farmers to obtain funding for nutrient reduction projects from banks more easily, Schafer says. A farmer figures out the cost of a nitrogen reduction project, receives assurance from the state that they will buy the reduction credits and-based on that guarantee-is able to secure funds for the proper technology or tools. While the legislation would need to be tailored locally, Schafer believes it could serve as a precedent for the nation’s other ailing waterways like the dead zone in the Gulf of Mexico. SB 994 is based off of the Colorado River Basin Salinity Control Program, which was created to reduce salinity using a competitive bidding program. But in terms of the Chesapeake Bay watershed, Schafer points out that the CBF can bid in the program using their initiatives along with everyone else, although he suspects CBF is concerned their bids won’t win because their projects aren’t working as well. If CBF can’t match the bids, it’s going to show that they have been failing for the past 20 years, Schafer says. On the other hand, Campbell notes considering who will gain substantially from the passing of SB 994 and who the supporters of the bill are, like Bion Environmental Technologies. “You have to consider the source and the original promoters of the bill, in particular,” Campbell says. The bill’s prime sponsor is Senator Elder Vogel of Pennsylvania’s Beaver County. The legislation was voted out of the Senate’s Agriculture and Rural Affairs Committee by an 8-3 vote. As of right now, SB 994 sits in the Appropriation Committee. The bill will move to the floor for a full vote this month when the legislature returns after a two month recess. If SB 994 passes, then it will move to the House. Supporters hope to have the bill approved this fall, although implementation will take a few years. Image of manure treatment technology at Kreider Farms in Manheim, PA.